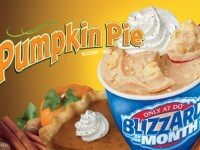 We previously posted that the Blizzard of the Month at Dairy Queen was Pumpkin Pie. However, in September they had both apple pie and pumpkin pie, and are still letting you order apple pie blizzards. 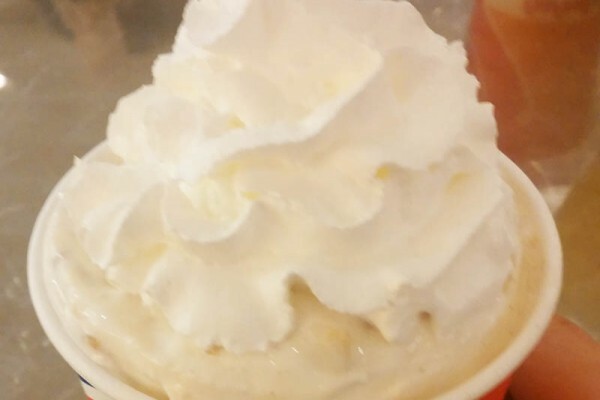 Since I’m not a fan of the pumpkin spice, I wanted to try the apple pie blizzard and let you know what I thought. First of all, I loved the whipped creme topping. They do this on all “pie” blizzards, and it especially works with the apple pie. 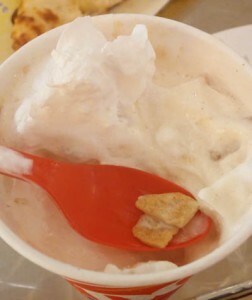 The apple cinnamon flavoring is well incorporated through the soft serve ice cream. There are two main components that give this the “apple pie” flavor: small chunks of apples, and these little thin pieces of cinnamon cereal. The small chunks of apples were okay. They had a jello like consistency, and there wasn’t very many of them. The thin cinnamon chunks tasted a lot like Cinnamon Toast Crunch cereal, but not as good. They didn’t have too much cinnamon flavor and were really thin. Hunger Filling Grade: N/A – I got a medium, which was really big, but as with any blizzard, you get filled up pretty quick. Value Grade: B – I used a BOGO blizzard coupon and paid a total of $3.79 for two. 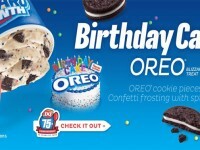 I think blizzards from Dairy Queen at retail price are pretty spendy compared to the alternatives. You might want to spend a dollar extra and get some Cold Stone ice cream instead, which is much better quality (real ice cream). Bottomline – It was a good try, and tasted really good (hey, it’s ice cream) but there wasn’t a whole lot of flavor. 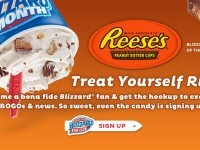 I would have preferred instead to get a candy bar flavored blizzard.